Is spring around your corner yet? Having never stayed in this mountainous countryside that is Nagano this time of the year, I have little idea as to when it should start feeling like spring here. The day is getting longer and the sunlight is becoming warmer, yes, but the wind is still bitterly cold and our fireplace is thus rarely out of fire. I think we had several warm days over the past few weeks, but it has definitely been mid-winter cold for these last few days. 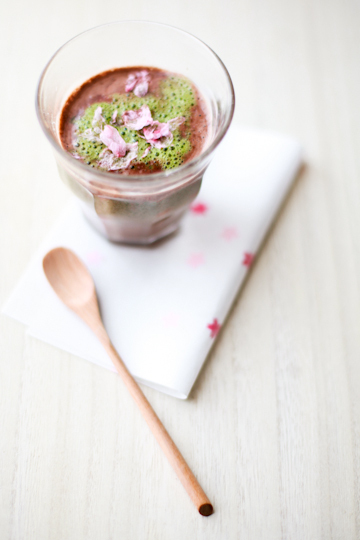 ...except it had a whiff of spring: sakura & matcha hot chocolate. Both matcha (green tea) and sakura tend to be paired with white chocolate rather than brown chocolate, perhaps to keep their colors - bright green of matcha and delicate pink of cherry blossoms -, but they both work well with bitter/milk chocolate, too. Here I loosely followed a recipe found in here (in Japanese): for each serving, heat 80-100 ml or so (little over 1/3 cup) of milk together with 2-3 heaping tablespoons of chopped dark chocolate, stirring to melt the chocolate thoroughly; in a small bowl, whisk together a heaping teaspoon of matcha and 2-3 tablespoons of boiling water until thoroughly blended and foamy; pour the chocolate milk in a glass and top with foamy matcha; sprinkle with some sakura sugar and a few petals from "blooming" sakura (a salt-cured cherry blossom soaked in water for a few minutes to remove excess salt, then microwaved until dried and popped); serve immediately. It's best not to stir before you take your sip, but allow the flavors of matcha and chocolate mingle together in your mouth, with a hint of salty sakura along the way. And did I say matcha and sakura tend to be paired with white chocolate? 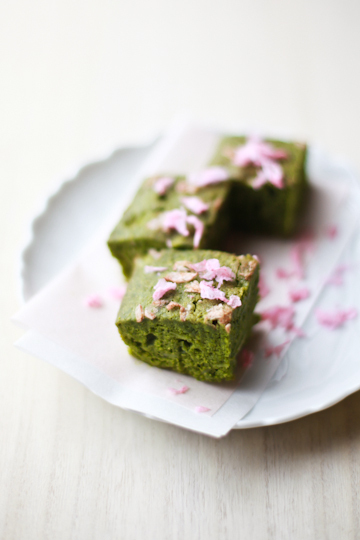 Well, they are, and for a good reason; mild, mellow white chocolate seems to take the bitter or sour edge off matcha or sakura (which, in food items, are usually prepared by curing cherry blossoms/leaves in salt), as it did in these matcha and white chocolate squares with sakura. The recipe (in Japanese) is basically a one for brownies, except the results were, well, not brown. Should I call them greenies? That sounds sort of wrong, but I don't know. You can look up the recipe in English courtesy of google translation - the translation leaves much to be desired, but you can at least get the ingredients (for your information, "soft flour" is supposed to refer to pastry flour, "tea" to matcha powder, and "BP" to baking powder). I used a little less white chocolate than specified, and added 1/2 teaspoon of sakura leaf powder. It can be a one-bowl (or -pan) recipe, as you can just melt the butter and chocolate together, add the egg, sugar, and sifted dry ingredients, mixing well after each addition of the ingredients. I sprinkled sakura petals (also from a microwave-bloomed cherry blossom) over the batter before baking (and some more before serving), but the sakura flavor here comes mainly from the leaf powder used in the batter. 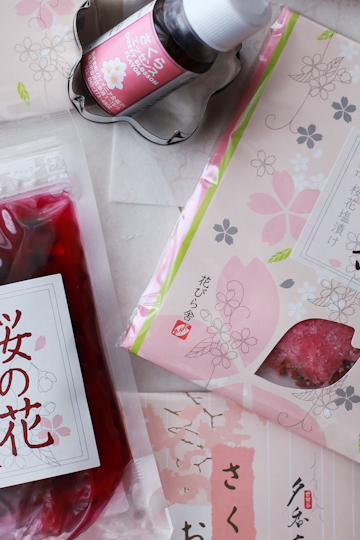 At first, I was disappointed as I didn't taste much of sakura, but when the squares were left overnight, the flavor became a lot more pronounced - though not overpowering. I used sliced blanched almonds, but chopped pistachios would have been nice, too. And yes, all the sakura stuff I used here? They are some of the things you'd find in my little sakura (cherry blossom) baking ingredient set, which I have created for a giveaway I was offering as a part of my fundraising campaign for disaster relief efforts in Japan. Over the period of ten days or so, the campaign has raised a little over six thousand dollars, even excluding the $100 that I put in as a kick-off. It has been such a humbling experience to see so much support given to this cause, along with all the words of prayers and encouragement. So thank you very much to you all, for all your generosity and support. I am sure that most of you who have donated through my campaign would probably have made a donation anyway using another route, even if I hadn't set this up. But I still like to think, perhaps selfishly and self-contently, that I might be making a bit of difference, however small it may be considering the magnitude of damage that we are facing. And if it indeed is to make any difference, it will have all been down to you who have supported my campaign. Thank you so much. Congratulations to three of you, and please claim your win, at the earliest, by contacting me via email with your mailing address. Your personal information (such as name and address) will never be used for any reason other than for me to send you the set. Please note that, considering the current situation in/related to Japan, it may take longer than normal for your package to reach you; so I would like to ask you to get in touch with me by the end of the month at the latest, so that you can hopefully receive it in time for the real cherry blossoms. In the event that you have decided not to claim your win for whatever reason, please write to me as soon as you can, so that I can arrange for another person to receive it. Also, in case you wondered - and if that is your concern: we are extremely lucky to be able to say that, so far, no radioactivity level that is a threat to human health has been detected here in Nagano (see a record of readings here). I have purchased and received most of the items for my sakura set before the present nuclear plant-related crisis erupted last week; those that came later were all sent from a central/western part of the country where there has been no higher-than-normal level of radioactivity reported. Anyhow, thank you very much again for your participating in the giveaway and making a contribution! I bought myself the same things that go into the set, plus a few more - so it looks like I'm doing a lot of sakura baking this spring, like I did last year. 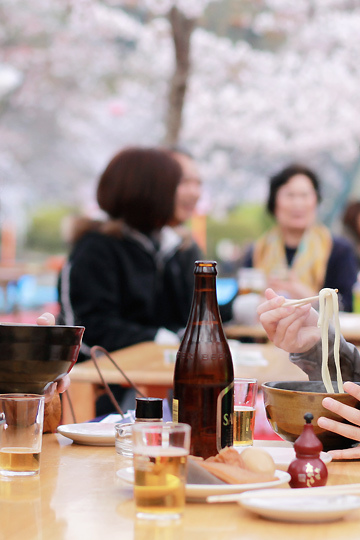 And last year, I happened to be in Kyoto during the sakura season. 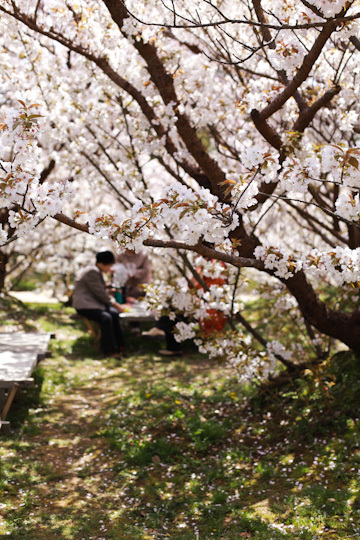 When I wasn't sampling all the sakura sweets, I devoted my time to chase the flower in town, left, right, and center - and a whole month has past like that, from the earliest blossoms in late March (starting with Kyoto Gyoen) to the last bits in late April. The pictures can be seen here as slideshow. 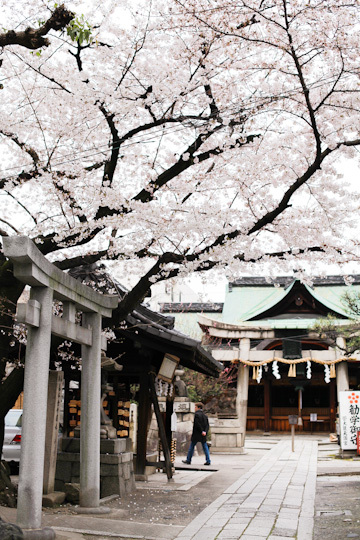 Kyoto is beautiful at any time of the year, but it simply takes your breath away when the town is in a glorious gradation of white to pink to purple. Once again, THANKS SO MUCH for your support to my fundraising campaign. And just so you know, I'll keep the donation page for a little longer if anyone would find it worthwhile to make a donation there, even if the giveaway is closed. Thanks! greenies. love it. it doesn't sound wrong to me :) glad to see that the fundraising went well. Lucky winners! Well done for raising that much money with your idea. I loooove this post! I stayed in Kyoto one week last year in june, I had a great time (and great food, too), but I guess it must be amazing with sakuras in full bloom. 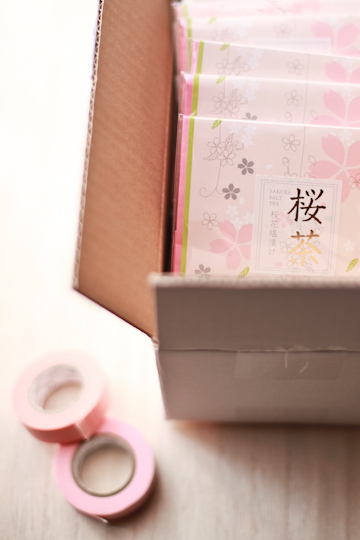 Do you know if any website delivers sakura-products to Europe? yay greenies. :P <3 matcha. I hope that all is well where you are in Nagano! I'm very happy that your fundraising was so successful, you took the initiative and made a difference - well done! 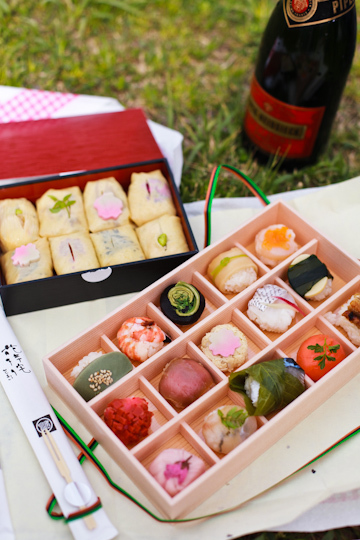 Your pictures of Kyoto are all wonderful, and I love the bento ones - beauty in form and taste. Beautiful pictures! 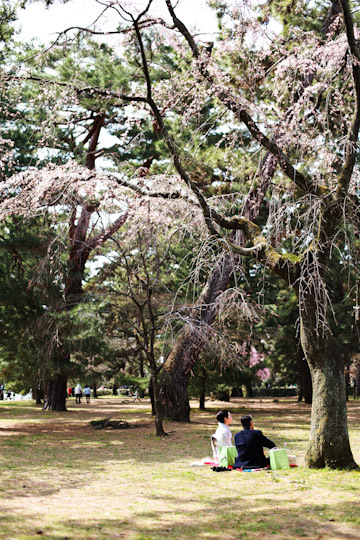 One day I hope to see the cherry blossoms blooming in person. I love this post. What a lovely taste of spring. Beautiful! Delicious! And fantastic pics! 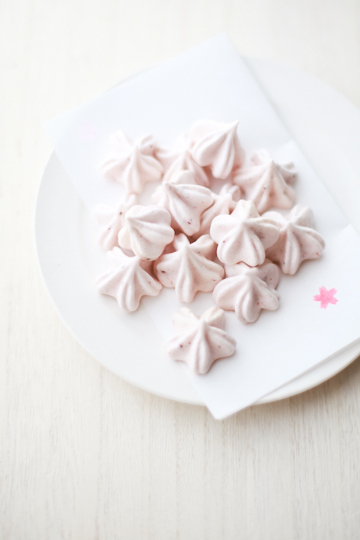 ^^ We didn't know your blog, but now that we find you out, you'll became one of our favorites! Aloha! I am glad that I stumbled over your site and I love it. it's fresh, clean, interesting and inspiring! I would love to get some green tea kit kats! And if you like something from Hawaii.. Let me know. I love mail exchanges! Oh! I wish I was there to see the cherry blossoms. Love this time of year in Japan. So Pretty. Lovely. Thinking about you. My friend A. just sent me the most beautiful pictures of cherry blossoms....hope! Your beautiful photos just took my breath away... I've been in Japan last month and I'd love to come back asap. I think I fell in love with your amazing country, first of all for the delicacy and refinement of all the people I've met. Congratulations on your fundraising and please keep up... All the best. I really like your blog , your pictures are awesome ! waht a lovely blog , and try to update it more oftern , I'd like to see your new post ! 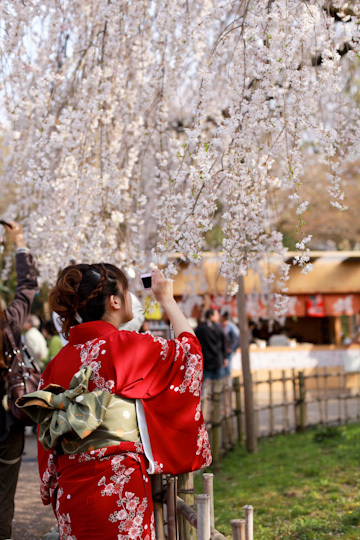 I hope I can go to Japan and see Sakura trees blooming one day.